Stephen and Kelly came to me via another photographer whose work i have always respected which is always lovely. The only downside to this beautiful wedding is working along my good friend and Videographer Daniel Yates. The Bridal preparations were at the Welcome hotel in Stratford Upon Avon, I have to say i was really impressed with the grandeur of this building, it was a great surprise. If any of the Bridesmaids are reading this, thank you for being such a lovely bunch of ladies, you made me feel so welcome. 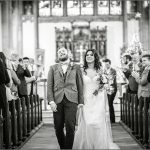 It was then onto St Marks Church for the service, with it being December we didn’t hang around, it was off to Swallows Nest Barn Leamington Spa for the wedding breakfast. Stephen and Kelly were simply wonderful on the day, so relaxed, really made my job a pleasure. Working alongside Daniel Yates who was capturing the day on video really added another layer of relaxation, he is a cheeky as me and like myself his soul purpose is to make sure a Wedding couple have a smooth relaxing day. Stephen and Kelly your Wedding day was perfect and Stephen your Groomsmen really made me laugh they gave and took the banter like true heroes. I’m sorry guys if there wasn’t enough crispy creme donuts for your guests, I admit to stealing one, but Daniel shocked me, at how many he can eat in one sitting, how he stays so slim is beyond me.